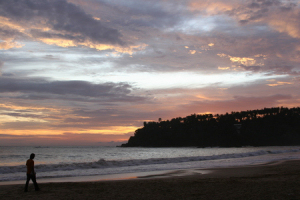 Mirissa Beach runs East to West along the Southern tip of Sri Lanka. In the morning time you are greeted by gentle colourful sunrises and then the sun crosses directly overhead throughout the day finally ending up give you a breathtaking and memorable sunset. Each evening at sunset Mother nature offers you something different, one night the sunset could be fiery red and then the next it can the most beautiful pastel pink. 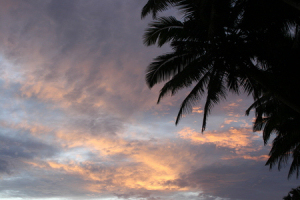 Many people grab a cool beer, bring restaurant chairs out onto the sand and sit and watch in awe at the array of colours as the sun sets behind the coconut trees on the hill. 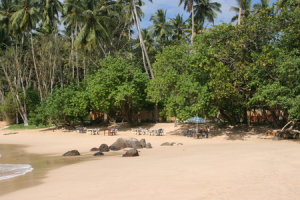 The shoreline is blanketed also with coconut trees and all the buildings are set back from the shore giving you the feeling that you are on a deserted beach somewhere. Most people start off early on the beach and abandon it close to midday as the heat becomes intense around then. It's a great time to retire to one of the many beach side bars and restaurants to replenish your lost fluids with a cool beer or a snack. After about 2 you will start to see people coming back for their afternoon tanning session. Unlike the beaches further along the coast, the shoreline of Mirissa gracefully slides into the ocean and there is no shelving making it a great place to bring kids and to leave them alone without too much worry. You can walk out into the water for about 20 meters before the water becomes waist deep. Beaches further up the coast have sharp drops and hidden shelving in the sands. Some days the water is completely flat and other days you are greeted by great waves originating from far out in the Indian Ocean. 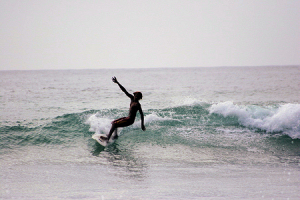 Nothing is more refreshing than hanging out where the surf breaks and getting a Mirissa style Jacuzzi. The center of the beach is the most popular as it is usually the calmest and it has easy access to some of the local restaurants should you need lunch or a drink. Ocean Moon has fresh water showers just inside the gate should you feel the need to wash the sand and salt off. About 90% of the beach is sandy and rock free but if its snorkeling you like, both ends of the beach are popular placed to explore the underwater life. Be careful though of the above water life and keep an eye out for incoming surfboards especially in the West end. If you are Snorkeling on the East part of the beach in and around Parrot Rock, be careful of strong currents and rip tides. Leave your belongings in your room because while you are underwater admiring the wonders of the Indian Ocean, the local kids will be admiring the wonders of your sunglasses and shoes. The West end of the beach is where the huge waves break and this area is extremely popular with the Surfing crowd, its not uncommon to see people here from all over the globe all satisfying their passion for riding the waves. Just listen for the Bob Marley music and you will know you are in the surf zone. The sand as you can see from the photographs is a light tan colour and the width of the beach depends on the tide but is usually about 10 - 20 meters.